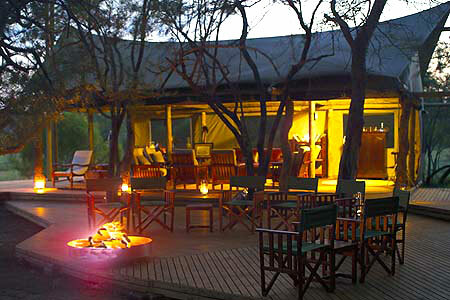 Plains Camp is perfect for safari traditionalists, who want the pioneering feeling of an old-style African safari, which includes bush walking in African Big 5 territory. 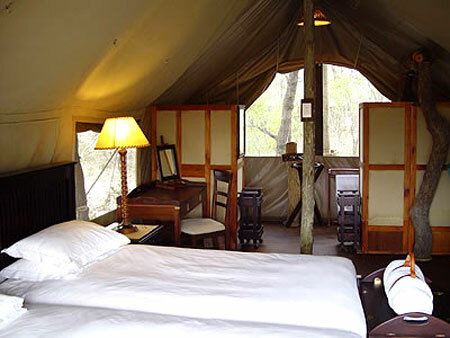 Plains Camp suits the 'Out of Africa' theme, right down to white linen, leather sofas, pith helmet, ancient gramophone and canvas chairs overlooking grass plains. 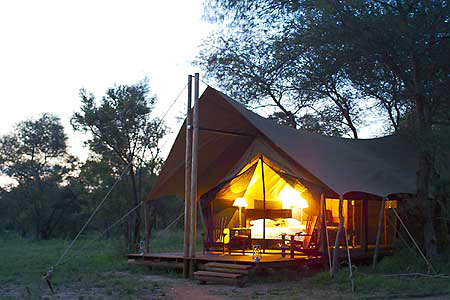 Plains Camp is essentially a walking safari camp, where the emphasis is on getting the earth beneath your feet and seeing what is around the next corner. You don't see as much as in a vehicle, but proximity to African animals on their own terms is exciting and the anticipation is thrilling. 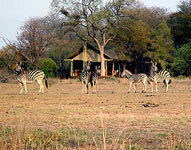 Plains Camp safari guides proved to be extremely capable and instilled great confidence in the novice safari walkers. This had little to do with the fact that they were carrying guns and more to do with their expert bush knowledge and obvious skills. Plains camp offers 4 comfortably furnished tents as sleeping accommodation, these tents are fully services includeing ensuite facilities, hot running water and all the comforts from home. After an early morning wake-up and an invigorating cup of fresh coffee in the lounge, guests set off on trail where our guides will share their experience of the diverse areas situated within the proximity of Plains Camp. The heat of the day will be spent at the camp, enjoying our small Africana book collection or the plunge pool overlooking the plain, which is often host to zebra, buffalo, giraffe, elephant, rhino and lion. Afternoon walks and sundowners complete a fulfilling African experience. The morning activity at Plains Camp will always be a safari walk, and the afternoon activity will be either a safari walk or game drive (by special request). Only one afternoon activity will be carried out at any one time as activities are planned ahead of guests' arrival to ensure there is no confusion. Guests will not be able to request an alternative afternoon activity from the group, except by prior arrangement with Rhino Walking Safaris. Should guests want a 'private' walk, the reservation team will need to know at least 7 working days ahead of arrival to source an additional guide, the cost of which would be for the guests account. No children under the age of 8 years are permited.